GTU CCC Phase 7 Exam Hall Ticket Download : Gujarat Technological University, Ahmedabad going to conduct GTU CCC Examination only for Government Employees. GTU CCC Phase 7 Exam Online Registration was held form 10-08-2015 to 13-08-2015. A large number of candidates applied for ccc exam. They all candidates can check GTU CCC Application Form Status through official site. Phase 7 Examination hall ticket now available to download here. 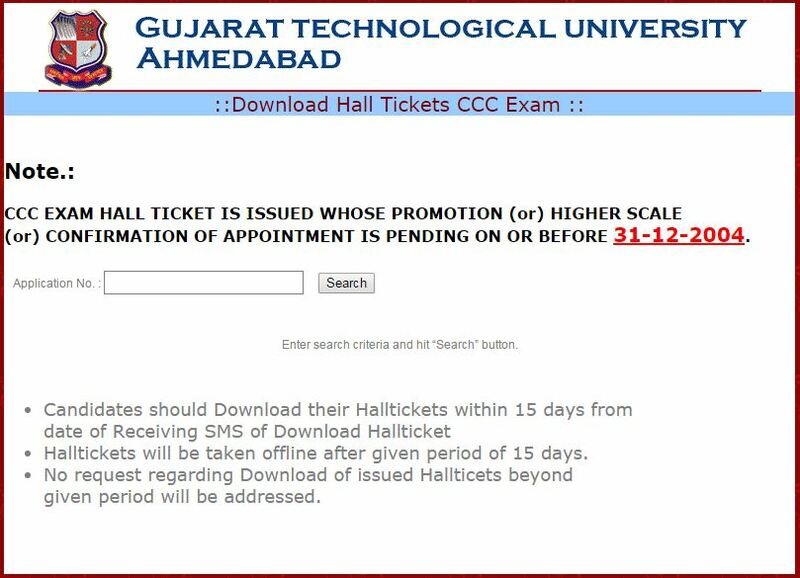 CCC exam hall ticket is issued whose promotion or higher scale or confirmation of appointment is pending on or before 31-12-2004. Candidates should Download their Hall tickets within 15 days from date of Receiving SMS of Download Hall ticket. Enter your application number to download ccc hall ticket.